There are many different NASes available for Mac users, and it is important that you find one that will best meet your needs. With all of the options that are available, it is highly recommended that you take the time to find one NAS in particular that has everything you are looking for at a price that is within your budget. Here’s a guide to help you find the NAS you are looking for your Mac in 2015. If you want to skip the article and want a quick summary, click here. The first and perhaps most important thing to consider when buying a NAS for a Mac is whether or not it will be compatible with your computer. Some of these storage devices are designed to work only with Windows computers, while others are designed specifically for Macs. Many of these devices will allow you to backup your data, and some of the ones that are designed for Mac compatibility allow you to use Time Machine to do this, though a strictly Mac HFS and formatted hard drive are both required. If you are currently looking for a Mac NAS, it is imperative that you find out which type of computer it is designed to work with so you can avoid wasting your time and money. What compromises are necessary when buying an NAS for Mac instead of PC? There aren’t many compromises you will have to make when it comes to buying a Mac NAS over one that is designed for use with a PC. NASes that are designed specifically for Macs are one hundred percent compatible with them, so you will be able to get everything a PC user would out of the one you buy. If you are inclined to use a Mac over a PC because you go graphic design work or some other reason, buying a NAS can be extremely beneficial and you won’t have to worry about missing out on any features that a PC owner would enjoy. Does Apple have its own NAS Solution? Apple does not make their own brand of NAS but there are many different companies that do, including Western Digital, QNAP, NETGEAR, Drobo, Seagate, and many more. Most of these companies make NASes that are compatible with Macs. 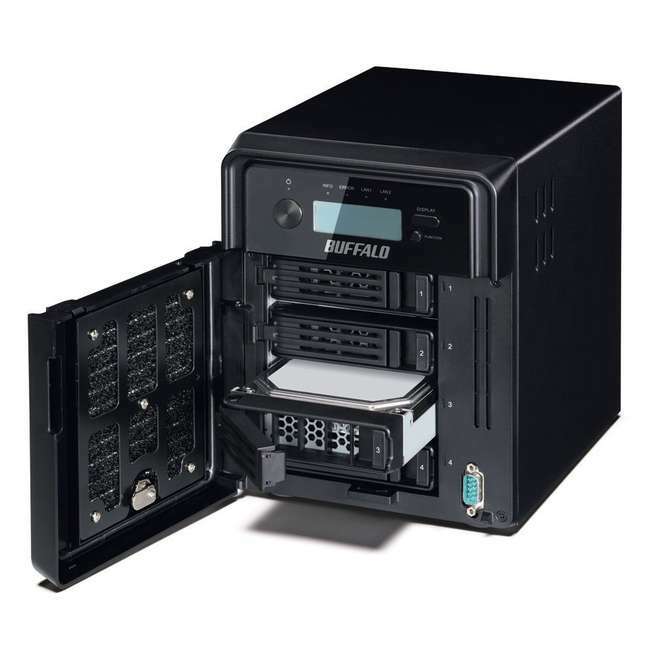 The Buffalo TeraStation 3400 is a fantastic 4-bay NAS for Mac. It comes with a full suite of Mac utilities as well as support for the Time Machine, allowing you to back up all of your data quickly and easily. This particular NAS is priced at around $500 for the 4TB version, which is a very reasonable amount for a higher-end model such as this. Hardware: The TeraStation 3400 has a speedy 1.33 GHz Marvell Armada XP dual-core processor as well as two USB 3.0 ports and two USB 2.0 ports. This NAS offers a lot of speed as well as the ability to hot-swap SATA hard drives. You will also get 1 GB of DDR3 RAM, which definitely adds to the overall power and efficiency of this machine. Design: There are four bays with this NAS, allowing you to backup your data so you will never have to worry about losing it. This NAS is compatible with SATA hard drives and it is VMware Certified for NFS. There is absolutely no doubt that this NAS was made for to be used in small to large businesses, offering a variety of useful features and an efficient yet impressive overall design. You will find that the TeraStation 3400 is available in 4, 8, 12, and 16 TB configurations. Features: This NAS comes with a number of useful features, including the Surveillance Video Manager, which supports up to 5 different cameras and is a great way to maintain a high level of security for your business. You can also configure this NAS as an iSCSI target so you can add virtualized storage to your business’s network without having to spend a lot of money to do it. The TeraStation 3400 allows you to remotely access and share data in a multitude of ways for maximum productivity. The interface of the software used to access, edit, and share data with this NAS is quite user-friendly and straightforward, offering an easy way to do whatever you need to with minimal complication. Performance: The sheer speed of the TeraStation 3400 is one of the main reasons that so many businesses have instead in it. In RAID 0, this NAS had a write speed of 66.8 MB/s and a read speed of 104.7 MB/s, revealing just how quick it really is at writing files. The Buffalo TeraStation 3400 is an excellent 4-bay NAS for Mac, that offers personal users, and also small to medium-size businesses a great way to store, access, manage, and protect their data. This NAS is one of the more affordable higher-end models and it is an excellent overall investment for many different companies that are in need of an extremely efficient way to share data across a network. 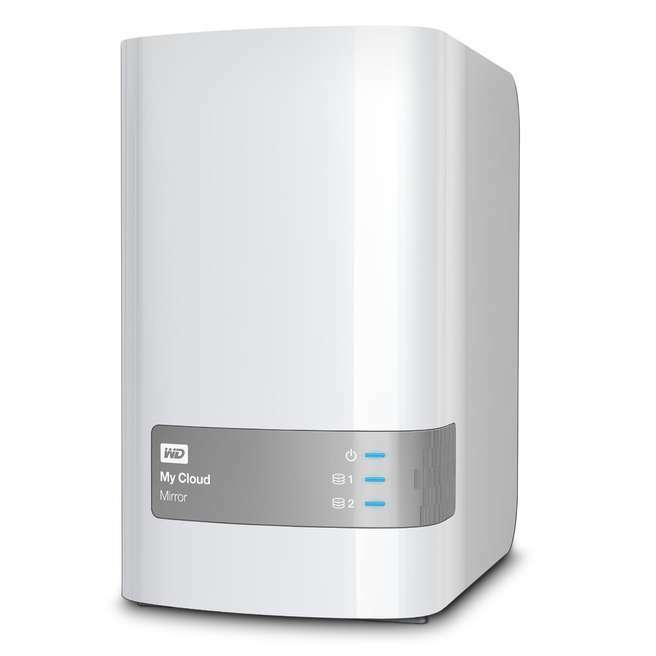 The Western Digital My Cloud Mirror is a great choice for those who are on a budget and need to save money on a good, reliable NAS. This storage device can be purchased online for less than $300 and it is fully compatible with both Windows and Macs. Hardware: The WD My Cloud Mirror uses a 1.2 GHz processor, which may not make it the fastest NAS on the market, but it is still enough to deliver adequate performance for many people and small businesses. This NAS also comes with 512 MB of ram, but it is highly recommended that you upgrade to 1GB for maximum speed and efficiency if you decide to buy it. Design: There are 3 LED lights on the front panel of this NAS, one of which is for power and the others for the status of the two discs. This NAS comes in 4,6, and 8 TB configurations, allowing you to choose one well that will perfectly suit your storage needs. The hard drive bays do not sit horizontally like most others, so you must open the bays from the top by gently pressing down on the release button. There is a bracket that holds all of the drives firmly in place. To take out the drives, you must unscrew the bracket and slide the drive out using a plastic tab that is attached to the bay. Features: The interface of this NAS is fairly consistent with that of all other My Cloud devices, and it has a very clean design that is easy to use with large toggle buttons for enabling and disabling its variety of features and services. You can choose to set up RAID 0 and 1, JBOD, and disk spanning, a configuration that writes data across both discs. The My Cloud Mirror offers excellent support for most of the NAS’s functions, including remote access, streaming with IPnP and DLNA, managing users and groups, and much more. Both ISO image mounting and iTunes are fully supported by this NAS. There is also an option for Remote Backup, allowing you to backup your data to another My Cloud Mirror or some other device. Performance: The My Cloud Mirror has an average write speed of 66 MB/s and a read speed of 58 MB/s. The overall performance of this NAS is certainly not the most impressive you will find with one of these devices, but it is definitely adequate for individuals and small businesses and for a personal use. 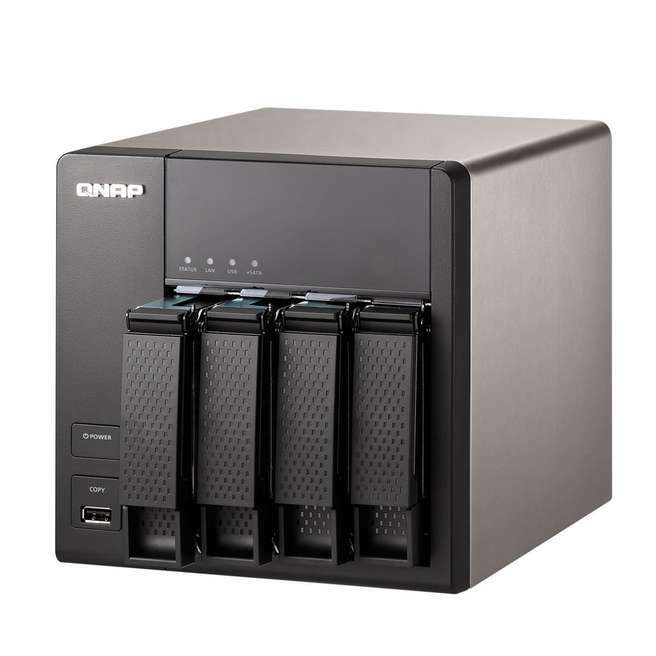 The QNAP TS-469L is a very powerful yet affordable network storage center that is easy to use and an excellent option for small businesses that are on a tight budget. With all of the different features and benefits this NAS has to offer, you will certainly want to learn more about it before deciding which of these devices you want to purchase. Available at just over $400, this NAS is a great bargain for frugal business owners or for a personal use. Hardware: This NAS comes with 1GB of RAM, but it is expandable up to 3GB. It can fit a total of four 3.5” or 2.5” SATA hard drives or SSDs and uses an Intel Atom 2.13 GHz dual-core processor. The processor in this NAS is partially responsible for its excellent performance, making it an extremely popular model indeed. Design: There are 2 Gigabit RJ-45 Ethernet ports as well as 2 USB 3.0 ports and 5 USB 2.0 ports on this NAS. While this NAS is not huge, it is also not exactly lightweight, weighing a total of 3.65 kg or 8.04 lbs. This NAS has an eco-friendly design that conserves electricity, as well as a smart fan that can automatically adjust its speed based on system use. If you want to save as much money as possible on energy bills for your business, this device is an excellent choice. The overall design of this NAS makes it equally useful for both individuals and businesses. Features: You will find that accessing, syncing, and sharing date is easier than ever before with the TS-469L. Qfile allows you to access, download, upload, manage, and share all of the files you have stored on the NAS in an easy and efficient way. Qmanager will let you monitor and manage this device remotely without even having to turn your Mac on. The Surveillance Station also has a user-friendly interface and it supports real-time monitoring, recording and playback with a number of customizable settings, and the ability to manage all cameras anytime and where with the Vmobile app that you can download to your iPhone. QNAP’s Netbak Replicator supports real-time and scheduled data backup with Apple Time Machine for Mac OS X users. Performance: The powerful Intel Aton 2.13 GHz dual-core processor is responsible for the fast read and write speeds of 224 MB/s and 208 MB/s respectively. The overall performance for this NAS is quite impressive and has a lot to offer for businesses that need a storage device that is able to read and write data quickly. The QNAP TS-469L is a truly amazing storage device that offers incredibly data security as well as the ability to quickly and easily store, share, and protect data on a network, whether it is at home or in the office. When it comes to NASes that are appropriate for business environments, this one is relatively inexpensive and has a lot to offer in terms of sheer performance as well as the wide variety of features that are sure to increase productivity in the workplace. If you are looking for the best overall NAS solution for Mac that will give you everything you need with regards to all of the combined features of the device, here’s our pick. The following NAS is a perfect overall solution for business and personal use that need a way to store and protect all of their sensitive data. The ReadyNAS 314 from NETGEAR is a great overall solution for businesses of all sizes that use Macs and need a storage device that will allow them to easily store, access, and protect all of the important data they have. Available in 4, 8, and 12 TB configurations, you will definitely want to take a closer look at everything this NAS has to offer before making a final decision of any kind. Hardware: This NAS has a 2.1 GHz dual-core Intel processor as well as 2GB of on-board memory, making it one of the faster and more reliable store devices of its kind. There are two USB 3.0 ports and 1 USB 2.0 port, which is definitely a plus. The processor that this NAS uses is representative of the move away from ARM-based CPUs in these devices, which is a trend that is leading to the support of demanding features like thin provisioning and real-time AV scanning of files. There is a single 92mm fat, which is smaller than that of the DS414, but it is more than adequate even still. Design: The 4 different bays that you will get with this NAS will allow you to backup your data and mirror it so you never have to worry about losing anything. This device is quite small for a 4-bay NAS, but it is definitely not lightweight. The overall build quality of the NETGEAR ReadyNAS 314 is quite impressive with a construction that is nearly all durable metal. Even the plastic drive cover has a very sturdy hinge as well as a magnetic lock, as opposed to the cheap covers of other NASs that simply press on and pull off. The two line LED display on this device is for status message, update, and boot information. Features: The AES 256-bit volume-based encryption and real time scanning for viruses, malware, worms, and Trojans, are just two of the great features that you can expect to get with this NAS. There is also support for iTunes server, Apple Time Machine backups, and DLNA. The VMware certification is another great feature worth mentioning, as it contributes significantly to this device’s reputation as being one of the best NASs on the market. NETGEAR has its own app store and remote file access through Android and iOS apps, so you can access, edit, and manage all of your data from anywhere in the world. Performance: With an average read speed of 33.3 MB/s and a write speed of 28.6 MB/s, it is a bit slower than some of the other models on the market, but still quite fast nonetheless. This NAS’s speedy 2.1 GHz dual-core processor is what makes its performance superb, but there is definitely still some room for improvement. 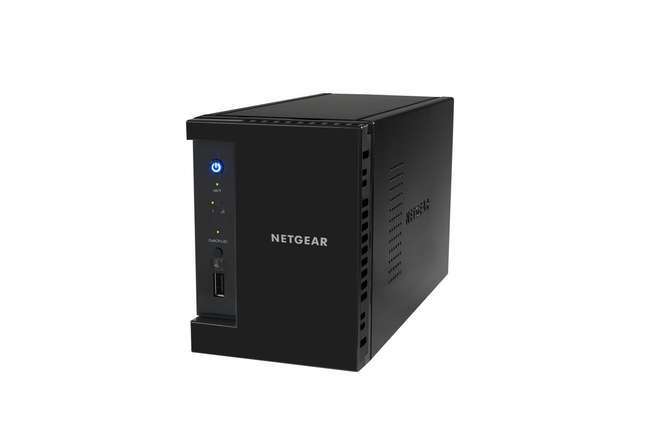 The NETGEAR ReadyNAS 314 is very well-suited for businesses of all kinds that are on a fixed budget and want a NAS that offers a variety of features that can maximize productivity. This particular NAS offers adequate performance and an amazing build quality that hasn’t been seen in one of these devices for a long time. Setting up this NAS is very easy and the software is extremely user-friendly, making it a great overall investment for companies that need a reliable and efficient means of storing, accessing, sharing, and securing data. Here are the all of the recommended NAS-devices for your Mac in 2015 by category. By clicking the links you can view and buy your desired NAS from Amazon.